It’s so important to dedicate some time to simply having fun with your teen, together, as a family. Pull him away from his iphone, tell him to pencil you in to his busy social life, and drag him out for an unforgettable night out in Chicago. Here are three suggestions for a fantastic evening out with your (usually) sweet teen. Start your night out on the edge of the clouds Double dog dare your kid into standing on a ledge, 1,353 feet up into the sky, on the 103rd floor of the Sears – ahem – Willis Tower (the 8th tallest building in the world and the tallest in the Western Hemisphere). 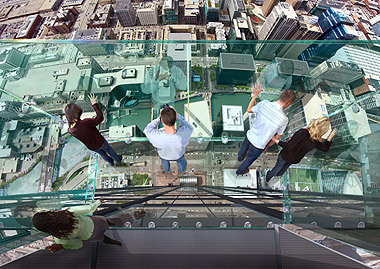 The Ledge’s glass boxes at Skydeck Chicago extend out 4.3 feet from the skyscraper’s walls. Look through the glass below your feet and you’ll get a taste of what it is to be a cloud. The Skydeck is open 365 days a year (April through September from 9am-10pm and October through March from 10am-8pm). It’s especially lovely at night, when the city’s lights and the stars above are positively shining. Consider purchasing a Chicago CityPASS which will give you VIP Access to the Skydeck as well as admission to four other must-see Chicago attractions for $76 (adults) and $59 (children) – a savings of over 50%. Catch dinner in a swanky River North restaurant Sushisamba (504 North Wells, Tel. 312-595-2300; sushisamba.com) will delight both the kids and the adults in your party. Watch as chefs prepare your sushi and encourage your kids to try a new roll or two. Alternatively, order a mix of a la carte small plates for some family-style sharing: we loved the sweet corn kackiage (Asian-style hush puppies with a black truffle aioli dipping sauce) and the kobe gyoza (savory beef-filled dumplings with a sweet pumpkin puree and su-shoyu dipping sauce). Clever fruity mocktails and sweet moshi flights for dessert round out your delectable meal. Sushisamba is just fancy enough to remind your kid that it’s a special night out, but still kid-friendly enough to be certain that everyone enjoys their meal. Check out the restaurant’s website and calendar of events and try to make reservations on an evening when a martial arts demo is taking place – Sushisamba has partnered with the Japanese Cultural Society and offers special programming focusing on the cultural traditions of Japan. 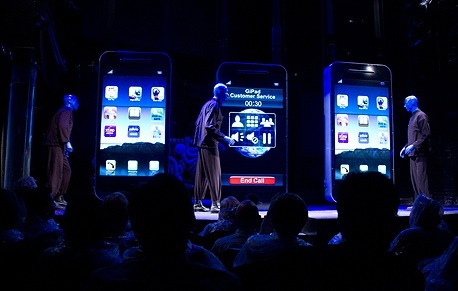 This entry was posted in Family and tagged Blue Man Group, Skydeck Chicago, Sushi. Bookmark the permalink.